These are my newly-discovered third (or fourth?) 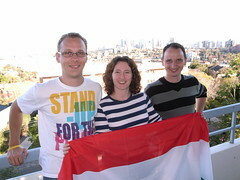 cousins from Hungary - Mate and Balazs, who are visiting Australia. Lucy met these guys when she visited Hungary years ago but she was the first to make contact. It's quite amazing to meet an entirely new branch of The Family ... just when you thought it was safe to come out of hiding, there are MORE Nogradys! Except, they spell it Nogradi - just to confuse you.